Click on pictures to enlarge.Text in italic is extracted from the Exhibition Guide 2004. "St. Jame's Park" by Jack Burnard. " The setting for the layout is completely imaginary but I have tried to incorporate as many park features as possible. 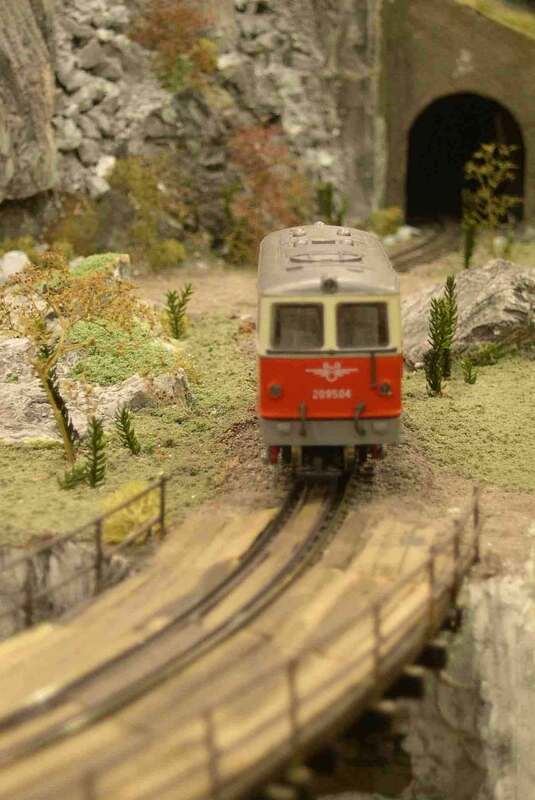 The park railway has two tracks, 9mm gauge (009 track) representing 11-inch gauge and 6.5mm gauge representing 7'/4-inch gauge. The locos are propriety but all the rolling stock is hand built on to propriety chassis. Figures are from a number of sources; Britains, Scalextric and Phoenix, but some are of military origin. The lake is about twenty layer of clear polyurethane varnish; buildings are made from card and have full interiors. The main feature of the layout is the day/night sequence, when it starts to get dark the lights in the building light up revealing their interiors. This has been a fun layout to construct and although not serious in conception there has been a lot of serious modelling in its construction. The layout has been used to test out various construction techniques that I may use in Gauge 1. " "Chevineaux le Grand" by Roy Pooley and Chris Richards, members of the SNCF Society. " The imaginary small town of Chevineaux is set "somewhere in Central France" on a busy, non-electrified line and is portrayed in the period 1980-85. A steady flow of traffic can be seen, from the humble "Picasso" (so called because of the elevated, off centre position of the driving cab) serving the smaller stations on the line, to the limited-stop gas-turbine powered RTG. On the freight side can be seen the local pickup freight train; the trains of general freight traffic which operate between main centres and the unit-trains of minerals or palletised freight. The occasional steam-hauled special also makes an appearance. 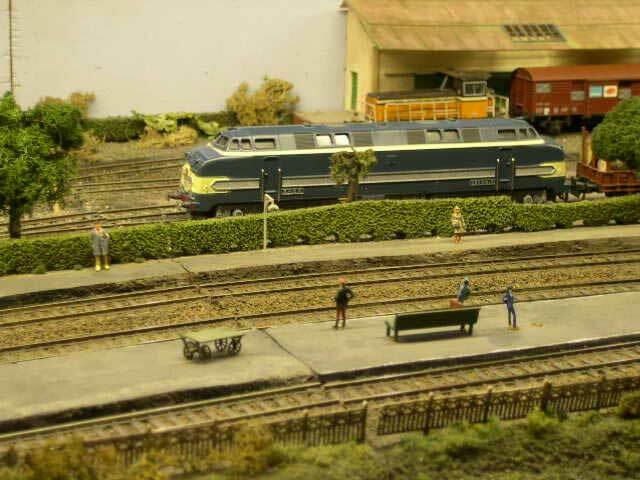 The model captures some of the features of French railways, which are so distinctly different from our own. " "Shark Fin Yard" by Keith Harcourt. " Stroud Chemicals uses the minerals of the Lower Colorado Valley to create paints, industrial chemicals and dyes. This layout represents the furthest outpost of the fictional firm, a remote yard where everything need for operations in the desert is shipped. A variety of locomotives and stock, hired as required from the main railroad operators, hauls all sorts of cars, of a range of ages, out here, where they are spotted, unloaded and reclassified before leaving for a cooling trip home. Shark Fin yard is scenically based on locations in the Sonorah Desert, South West USA, where temperatures can exceed 48 degrees Celsius (120F) and surfaces can reach 82C (180F). People don’t stand out in the sun here and even the trains don’t hang around long. 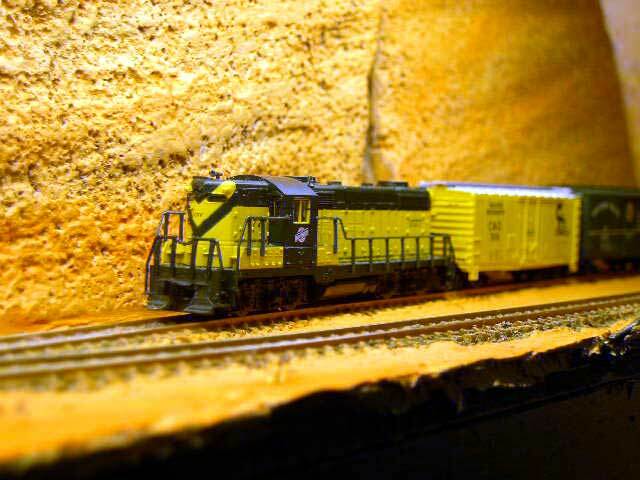 Some diesels can’t even stand still because of air conditioning problems and you may see them shuttling from one end of the yard to the other to keep cool. The buildings are of bright aluminium to reflect as much heat as possible. 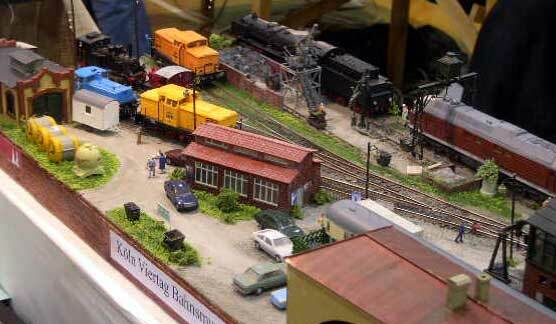 The layout is a “Micro Layout” of the type popularised by Model Rail International Magazine. The track plan owes much to the work of Carl Arendt, Jack Trollope and others published in MRI but also on the Internet at: http://carendt.com/ "
Left: "Ybbstalbrücke" by Brian Champion. " This exhibit is mode of an operating diorama than a layout. 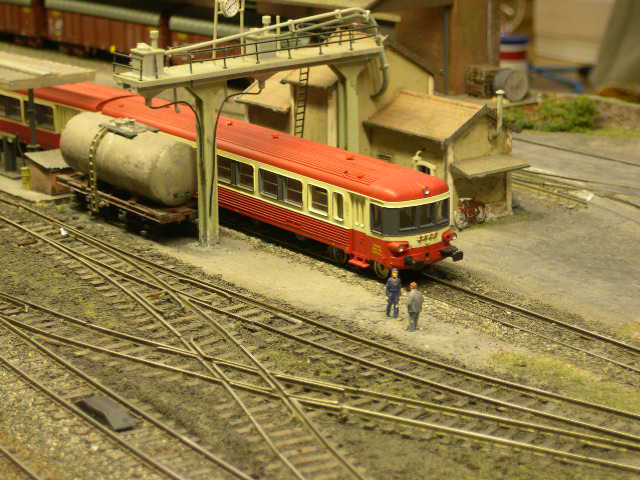 It is a simple oval with storage sidings behind the backscene. There is no station as such and no turnouts in the scenic station. The scenary is home rock castings from vinyl moulds. Brian does not think the real Ybbstalbrücke has any avalanche tunnels so modeller’s licence has kicked in. Track is Lilliput and Peco. The bridge is kit-bashed from Plastruct and American truss bridge kit. Locomotives and stock are Lilliput. Scenery materials are from the Set Scene product range." Right: "Maalix" by Mervyn Kendall & Louis Watkins. " 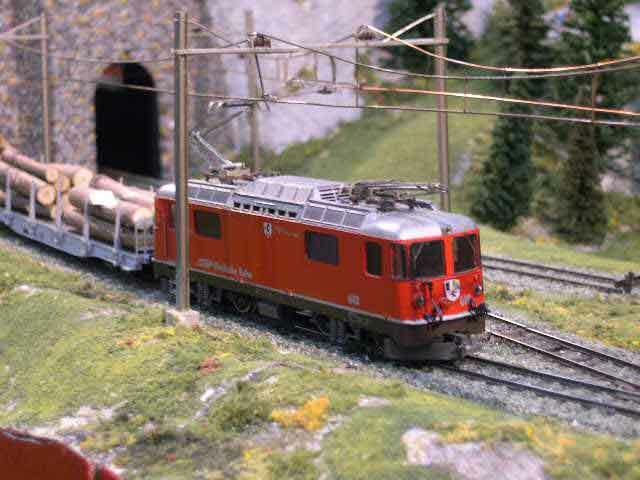 The layout is based on the metre gauge Rhaetian Railway of south-eastern Switzerland. 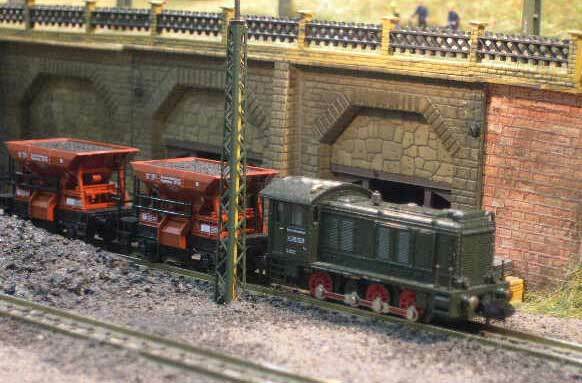 The location is fictitious but the layout has been designed to incorporate features giving a flavour of the railway and the scenery through which it operates. ."
Left: "Saint-Denys" by Andrew & Simon Tucker. " The London and Southampton Railway started running trains between Southampton and Winchester in 1839. Twenty years later the LSWR (as it had become) opened a station at St Denys, just outside Southampton. At that time it was known as Portswood and In 1866 the station became a junction with the opening of the branch to Netley which eventually reached Fareham forming the route for the present day services to Portsmouth and Brighton. The main line was electrified on the Southern`s third rail system by British Rail in 1967 and the section from St Denys to Fareham in 1990. Our model is set in the Network SouthEast period in the early 1990s. From the station footbridge the west end of the platforms and all of the junction trackwork, including the quadruple track towards Southampton, has been modelled as far as the Dukes Road bridge to scale length. We will be operating a typical service of trains which would be seen passing through the station. In addition to the electric multiple units there are the long distance InterCity Cross Country and Regional Railways passenger services. " Right: "Cunning Plan" by Chris Peters, Allan Peacock and Chris Pennells. " Genailer Plan or Cunning Plan in English has it’s origins in Austria and Germany. After visiting shows in these countries I saw many very long modular layouts, we can do something like this I thought!! So and after 18 months to 2 years of throwing paper in rubbish bins, the team as we now are came up with the board profile design we now use as standard. 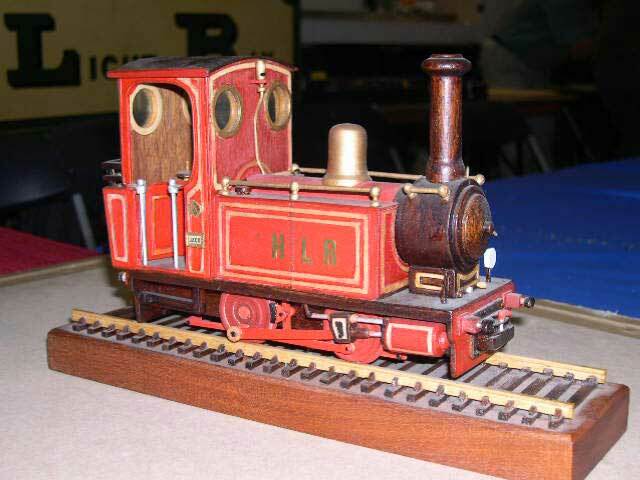 All boards are a maximum of 15.5 inches wide at the ends, and as long as the individual modeller wishing to make them. " "Köln Mülleimer" by Andrew Knights. " This layout was built to show what could be done in a limited space. 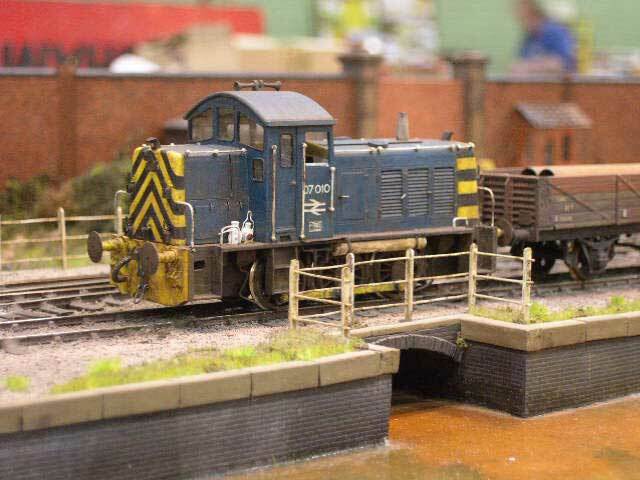 The scenic part of the layout is 2m long and just over 30 cm deep. There is a fiddle yard. Though this could be added to a curve, so it would stick out the front of the layout, if it were in a domestic situation. 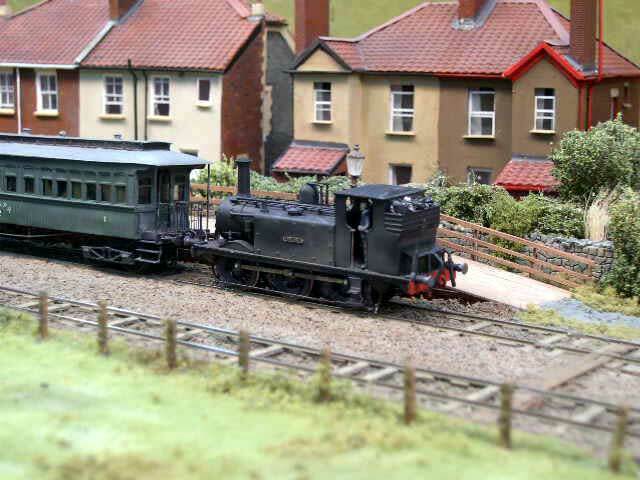 A box bedroom would be an ideal location for this layout. 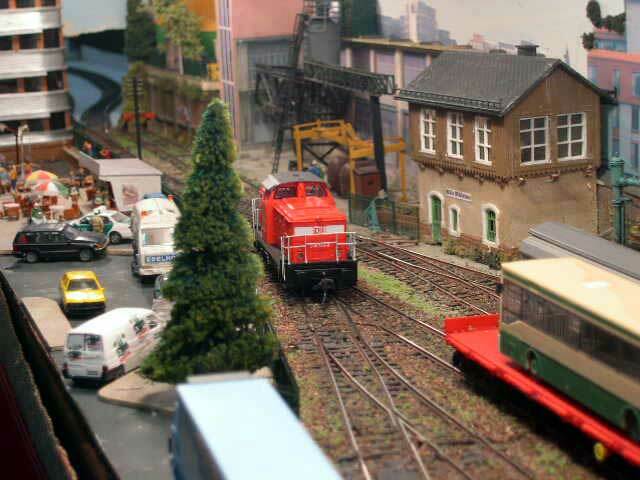 The basis of the layout is a small yard served by one of the larger freight yards around the city. This type of yard is vanishing but may still be found. 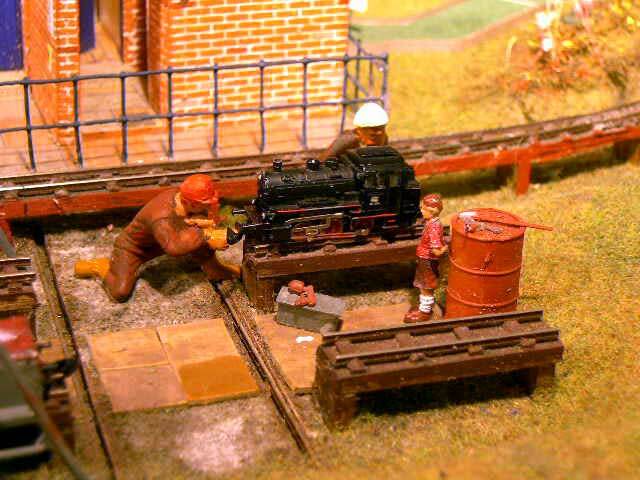 There is a small factory on the site and this still receives the odd wagon load of freight. A truncated passenger line is served by a mixture of trains. Loco hauled push pull trains or the new Talent units. Normally the station only has an infrequent out of rush hour service. However the “Volksangenfest“ has caused a flurry of extra services. There may even be the very occasional Dampfzug! The track plan has been designed to maximise operation, with limited facilities. 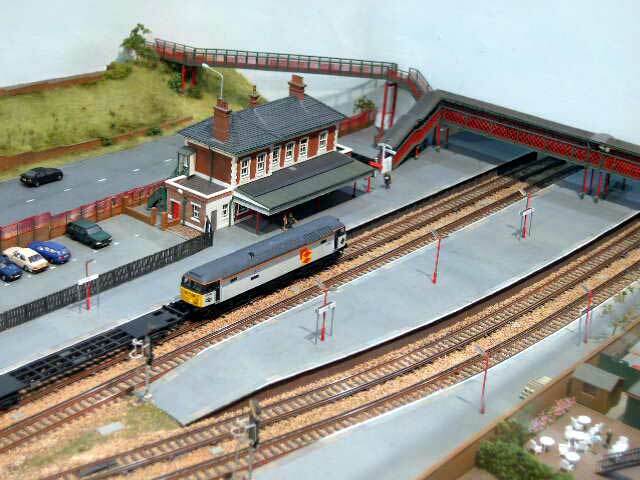 Many of the buildings are on their second life as are many items used on the layout. Hence, in part, the name of the layout. One use of a Mülleimer is a recycling bin! " 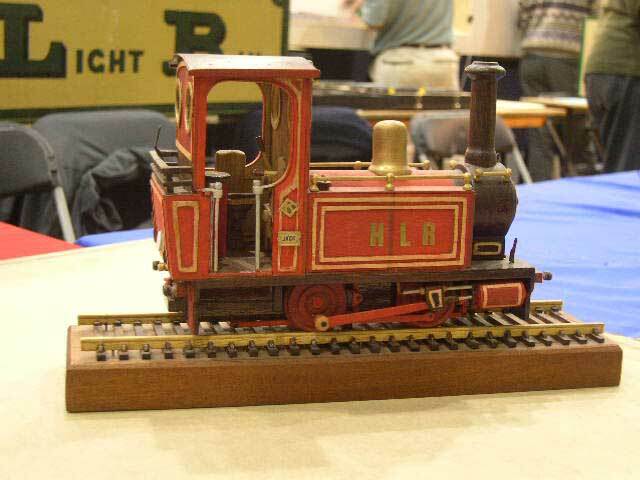 A model of an East Hayling Railway locomotive on display on the society's stand. " 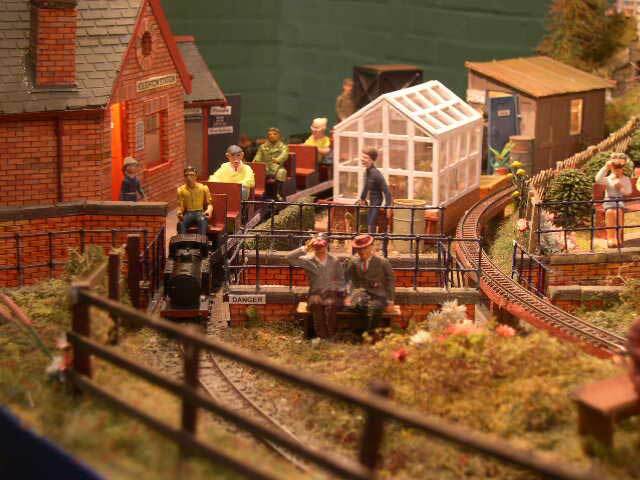 The railway is owned by a Mr Bob Haddock and supported by a band of volunteers, in the early years there were less than 10 members but now we boost a following of 70 plus members. The railway is given much valuable help and knowledge by the members of the society. Members of both sexes over a wide age range make up the membership to date. Trained volunteers undertake engine driving, guarding, ticket selling, building, maintaining and every other task on the railway. The railway opened for passenger service in July 2003 after 19 months and 2 weeks of hard labour. The railway is located along the seafront on Hayling Island, Hampshire. Come, have a chat on our stand and if you may wish to join our society. We will help you train for whichever positions you aspire to. Chairman Terry Mercer, 20a St Ronans Road, Southsea, Hants PO4 0PT. Telephone 023 9371 7550 after 6pm. " Left: "Canada Road" by Peter Johnson. "Canada Road models the era when docklands were not all smart executive homes and attractive waterside pubs. It is somewhere between the mid 1960s and 70s, on the fringes of a major port. Worn down black steam engines are reaching the end of their days, green diesels have arrived but are soon swept by a tide of corporate blue paint, the colour of trains from my teens. Soon all shunting will be handled by the universal Class 08, but not quite yet..."
Right: "Weston-super-Mare" by Andrew Ullyott. " Weston, Clevedon and Portishead Light Railway (WC&PLR) circa 1936. This line opened from Weston to Clevedon as a tramway in 1897, converted to a ‘Light Railway’ in 1899 and extended to Portishead in 1907. It allowed local residents travel between the Somerset coastal towns without need for lengthy inland detours via the Great Western Railway. In financial difficulties from the beginning, ‘Colonel’ H F Stephens was appointed General Manager in 1911 but despite returning occasional profits, the fortunes of the line steadily declined and the last train ran on 18 May 1940. The WC&PLR’s rolling stock was quirky to say the least and generally comprised run down, second hand equipment, bought cheaply from other railways, some of which were also run by Col Stephens. There were a few notable exceptions, such as the infamous ‘American’ coaches. My layout depicts the Ashcombe Road terminus in Weston-super-Mare as it was in the mid 1930s before the south side of the line was developed. Baseboards are built from plywood and trackwork is hand built, comprising code 60 flat bottomed rail soldered to copper clad sleepers/concrete pots, laid over a foam camping mat base and ballasted with granulated cork. 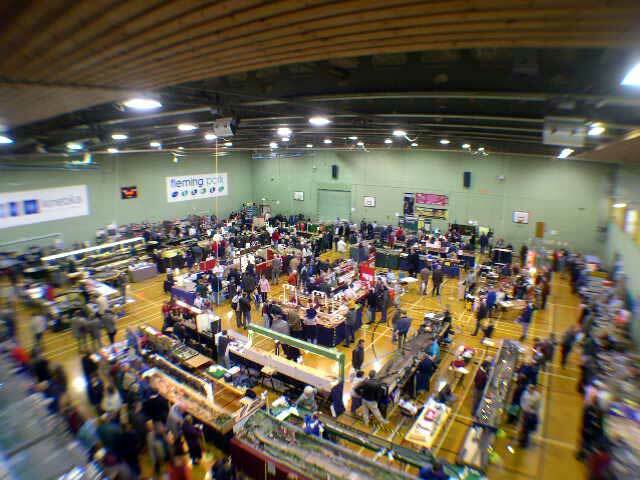 Stock is a mixture of kit built and scratch built items. More locomotives and coaches are presently being built. With the exception of the station, all other buildings remain today and the track bed is a cycle path. " Text and pictures copyright ©2004 by Ian How and respective Exhibition Guide writeups authors. Web Hosting and page layout by Frédéric Delaitre.